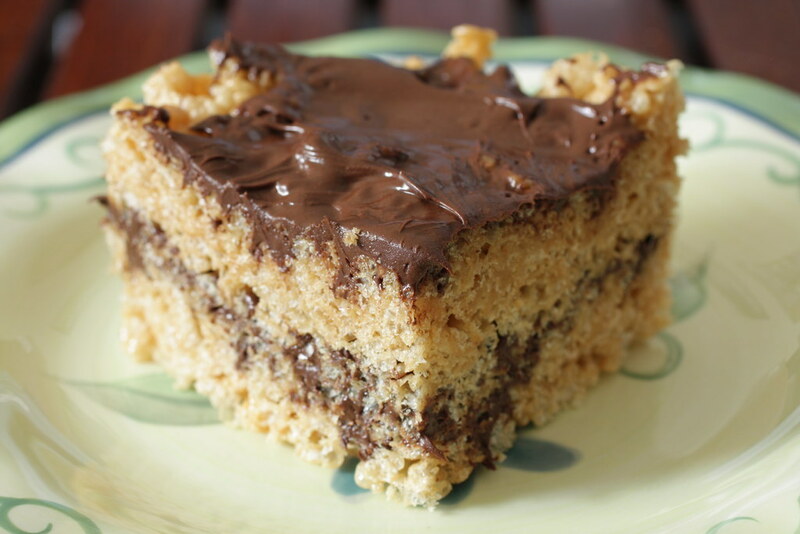 Ive already demonstrated that I have a weakness for chocolate and peanut butter rice krispy bars through parts one and two of my peanut butter crispy bar wars. A couple of weeks ago when my parents were visiting, my mom and I spent some time flipping through my stack of food magazines. I am the person who arranges old issues by month and season, so I can immediately grab the June issue of every cooking magazine I own. Yes, I am that big of a dork. But in this case, it was the very last recipe of the new Everyday Food that caught my attention. We were planning on grilling simple burgers and hot dogs for dinner that night, and this easy recipe for chocolate-peanut butter rice krispy bars seemed to be the perfect ending to a laidback meal. They did not disappoint. Frankly, I have to say I like this particular recipe the best I like the combination of the marshmallows and peanut butter, as opposed to using corn syrup, which produces a harder bar. Plus, these are so easy to make that you really can whip them up in less than ten minutes, or put anyone to work in your kitchen. Butter an 8×8 inch pan. Combine butter, peanut butter, marshmallows, and salt in a medium saucepan over medium heat, stirring until marshmallows are melted. Add rice krispies to pan, stir until well combined. Add half of the cereal mixture to the bottom of the pan, pat into place with waxed paper covered in butter. Spread half of the melted chocolate over cereal; repeat with remaining cereal and chocolate. Allow to cool and cut into bars.